Please join Virginia’s 8th District Republican Committee at a fundraising reception with our special guest, Congressman Allen West (R-FL). 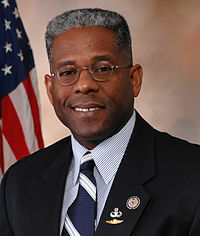 Rep. West needs no introduction as a retired U.S. Army Lieutenant Colonel and one of the leaders of the 2010 GOP congressional freshmen class. He is one of the most in-demand speakers around, and we are thrilled to have him for a fundraiser this year! The event will be held on Thursday, October 27 from 6:00-7:30 pm at the Landini Brothers Restaurant, 115 King St. in Old Town Alexandria (map). Contact va8gopchairman@hotmail.com with any questions. We hope you can join us! We will be patron. Arlington Republican Woman’s Club. Sending check in the mail. Thanks for every other great post. Where else may anybody get that kind of info in such an ideal means of writing? I’ve a presentation next week, and I am at the look for such info.